The media at large voiced concerns about the crime rate in South African cities and no one knew quite what reception the so-called Rainbow Nation would give to a rugby tournament so soon after the end of the hated apartheid regime. 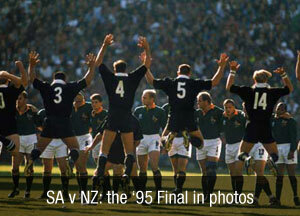 However, the hosts, South Africa, were taking part in a World Cup for the first time after their official re-admission to the worldwide rugby family in 1992, and were bound to put up a huge challenge to take the title of world champions which many in the Republic had claimed for themselves in the long years before and during their sporting isolation. Big wings had been seen before but Jonah Lomu broke the mould. He bounced off would-be tacklers with ease and turned innocuous looking situations into outrageous tries. Lomu shattered England with four tries in the semi-final, famously running over Mike Catt and swatting off Tony Underwood. He was termed 'a freak' by Will Carling but the world hailed a new sporting hero. Stransky's nerveless dropped goal to win the Webb Ellis Cup might have lived on in the same way as Jonny Wilkinson's would do in 2003, but when Francois Pienaar was presented with the trophy by the country's president Nelson Mandela - wearing an identical green Springbok jersey - an iconic image was created which will recall forever South Africa's World Cup.